There are many things for students in the United States to consider when thinking about which college or university to attend. This includes the location of the school, whether it is in a big city or the countryside, the size of the student population, and even how well known the school is. But as the cost of U.S. higher education keeps rising, another consideration for many students is return on investment. Not all colleges and universities require a lot of money for a student’s education. But at some schools, students can expect to pay hundreds of thousands of dollars within the normal four-to-six year study period. If they have to spend that much, students want to know what they can expect to earn in their chosen career field. In 2013, then-U.S. President Barack Obama’s administration launched an online tool to help students decide which college or university to attend. It is a Department of Education-operated website called College Scorecard. The department created the website as a database for all kinds of information on schools across the country. 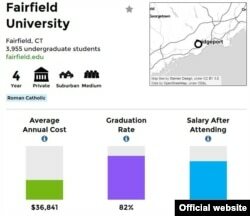 It lists information on yearly costs, average student debt, completion rates and expected job earnings. The Obama administration put all this data in one place as a way of providing answers to questions about higher education. “We know students and families … often … feel they lack the tools to … decide which school is right for them,” noted then-Secretary of Education Arne Duncan. Critics raised questions about whether the data treated all schools fairly and whether it was helping some schools, but not others. Some were concerned that the website was designed only for students receiving financial aid from the federal government. And others argued that the data failed to demonstrate the student experience at some schools. But generally speaking, College Scorecard has been a useful tool for Americans wanting to make informed decisions about higher education. So says Kaitlyn Vitez, higher education campaign director for the U.S. Public Interest Research Group. The group, also known as U.S. PIRG, is an alliance of activist non-profit organizations across the country and in Canada. Recently, the administration of President Donald Trump made a change to the College Scorecard that critics say limits its usefulness. In September, the Department of Education removed all the national median data from the website. 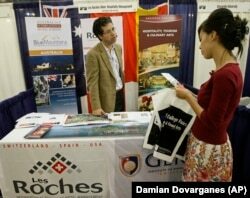 A student asks aboutLes Roches, an International School of Hotel Management, with an admission program director at the National College Fairs event in 2009. The national median data provided the national average for any of the qualities and groupings listed on the College Scorecard. For example, if users looked at the debt they could expect to take on from studying at a given school, they would also see the overall average for all the schools in the system. This gave students at least some kind of general comparison when weighing costs and expected results, said U.S. PIRG’s Kaitlyn Vitez. She added that without this information, students might not be able to tell if a school is successfully serving students as well as others. Vitez noted there are other ways for comparing the return on investment from colleges and universities. But some publications give more attention to schools that are well-known and respected, but not necessarily the best value. Vitez said the current administration would want to limit this kind of information because of its support for for-profit higher education. The Obama administration took legal action against several for-profit schools, accusing them of wrongdoing. Vitez said the current Secretary of Education, Betsy DeVos, has taken steps to remove rules that she considers harmful to the for-profit higher education industry. This includes announcing plans to cancel a rule requiring schools to ensure that their graduates find good-paying jobs. But the Department of Education argues that the national median data has serious problems and is not that clear. In a written statement, a department spokesperson noted that the national medians were established with data from every school receiving federal money. The official argued it is unfair to compare all schools with the same measures, as many colleges and universities are very different in important ways. For example, a selective school that serves mostly wealthy students will have different outcomes than a school that mainly serves poor communities. One example of some of the information the Department of Education provides about a given college or university through the College Scorecard. However, even some supporters of Secretary DeVos and her efforts find the change in the College Scorecard troubling. Daniel Elkins is the legislative director for the Enlisted Association of the National Guard of the United States. His organization represents the interests of thousands of members of the U.S. armed forces. Elkins says his group was pleased with recent actions by DeVos, including the plan to remove the employment guarantee rule. He argues it does not correctly punish all the schools guilty of underserving their students. However, he said, the removal of national median data is a move in the complete opposite direction from where the department should be heading. Elkins notes that many armed forces members who seek a college or university education are non-traditional students. This means they are likely the first in their families to go college and may have little money of their own. He noted that their families may not be able to help them financially or have experience with higher education. The U.S. military offers financial aid for education to some of its members. But many of them often need to take out loans to help pay for college. Elkins and Vitez agree any lack of knowledge can lead them to borrowing from bad lenders or attending bad schools. And the special tools the military uses to help members find good schools depend on information from College Scorecard, including national medians. In October, Elkins’ organization released a joint statement with several other military veterans groups. They asked the Department of Education to return national medians to the College Scorecard by mid-November. The information has yet to return to the website. We want to hear from you. What do you think is the most important information a person needs when they choose a college or university to attend? Write to us in the Comments Section or on our Facebook page.